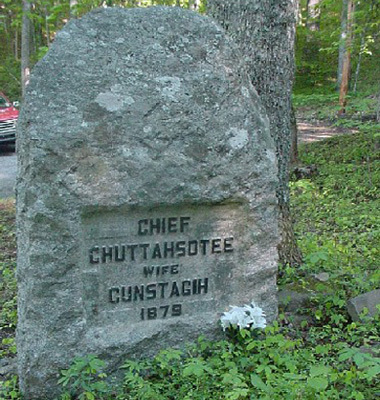 Source: Gravestone of Chief Chuttahsotee, Franklin, NC. Courtesy of Western Carolina University's An Adventure of the American Mind (AAM) program, from the personal collection of Mary Lynn Duncan. The grave marker, approximately four feet tall, is made of granite. The face bears an inscription to the memory of Chief Chuttahsotee and his wife Cunstagih. Duncan, Barbara R. and Brett H. Riggs. "Sand Town Indians" in Cherokee Heritage Trails Guidebook (Chapel Hill: University of North Carolina Press, 2003), 164-65. St. John's Episcopal Church placed the tombstone on July 30th, 1932. Every year on August 17th the church holds a memorial service for the chief of the Sand Town Cherokees. In 1838, in response to the influx of the white settlers, the United States Government decreed removal of the Cherokee to Indian territory in Oklahoma. Many Indians died during the forced march on the “Trail of Tears”, but some escaped and traveled back to their homeland. Among these were Chief Chuttahsotee (Chutasohti, also known as Jim Woodpecker) and his wife Cunstagih (Sally Woodpecker) and many of the Indians of the Sand Town settlement on Muskrat Creek, a tributary of the Cartoogeehaye Creek which enters the Little Tennessee River just south of the City of Franklin, North Carolina. One of the early white settlers in the Cartoogeehaye Valley was William Siler who arrived in 1822. William lived in peace with his Cherokee neighbors. When they reappeared in the valley, he deeded land to Chuttahsotee on Muskrat Creek. Now, as legal landowners, they could not be removed from their homes. Chuttahsotee and his wife Cunstagih (Sally Woodpecker) died within two days of each other in August 1879. According to local tradition, when her husband died, Cunstagih stated that she loved Chuttasotee so much that she would be with him when the sun went down. In the early 20th century, the Sand Town Cherokees left Macon County to join the rest of the Eastern Band on the Qualla Boundary. The only remnant of the community is the gravestone of the chief and his wife. St. John's Cartoogechaye Episcopal Church and its small cemetery are located in the valley of Cartoogechaye Creek. The graves of Chutahsottee and Cunstagih are in the southeast corner of the cemetery, located on Johns Church Road. The grave is located in a wooded area. Every year on August 17th the church holds a memorial service for the chief of the Sand Town Cherokees.